Stickers explaining the 68-cent gasoline tax have started to appear this month. As Washington drivers fill their gas tanks for cross-state trips this season, thousands will see new stickers announcing the tax is 67.8 cents a gallon. It’s the second highest in the nation, after Pennsylvania at almost 77 cents a gallon. Our state charges 49.4 cents a gallon, and the federal government another 18.4 cents. 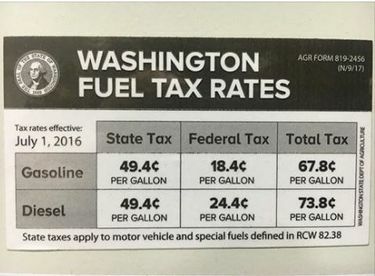 Taxes are almost one-fourth of the current total of $3 per gallon in Washington state. Stickers have just started to appear around Seattle, according to Rep. Cary Condotta, R-Wenatchee, whose budget amendment to notify gasoline customers passed unanimously, at taxpayer cost of just $4,000. “I’m certainly getting a lot of feedback about it, all positive,” Condotta said Monday. He said it’s useful to inform people how their spending is split between fuel and tax. “It could make it more difficult to raise taxes,” he guessed. The program started Oct. 30. Stickers will be gradually fastened to pumps over three years, during routine inspections by the weights and measures division of the Washington State Department of Agriculture (WSDA), said agency policy assistant Steve Fuller. Retailers who want them sooner may call 360-902-2035 or e-mail wtsmeasures@agr.wa.gov. The 49.4-cent tax includes new gas taxes of 11.9 cents in 2015 and 2016 that lawmakers approved, to fund $9.4 billion to build highways and local roads along with $1.4 billion for maintenance, in the bipartisan Connecting Washington plan. Washington highways are almost entirely user-funded through gas tax and tolls, while local roads are supported by a hodgepodge of sources.